With rumors of a revamped Apple TV circulating over the past few months, German magazine Curved has been exploring some concepts to help get discussion rolling, beginning earlier this month with a new box similar to the current one but with styling similar to Apple's latest iOS devices and with a versatile iPod touch-like remote. In its latest concept, Curved follows the trend of Google's Chromecast, Roku's Streaming Stick, and Amazon's rumored device to picture the next Apple TV as a simple dongle that plugs into an HDMI port on the back of the user's television set. 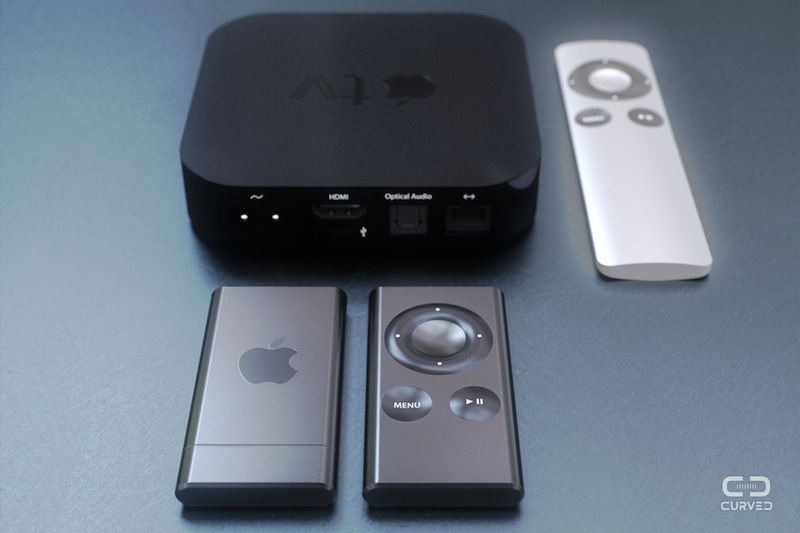 The concept envisions the "Apple TV Air" package containing two similarly sized devices: the dongle with a cap for the HDMI connector and a separate remote offering the same button configuration as on the current Apple TV remote. Both devices would be made of plastic to allow for a Bluetooth wireless connection to control the dongle hidden away behind the television set. Apple has been rumored to be exploring a number of enhancements to the Apple TV, including enhanced game support that could see the launch of an App Store for the device. Apple has also been rumored to be looking at integrating AirPort base station functionality for the next Apple TV. Depending on how aggressive Apple wants to be with the new device's capabilities, it may be a stretch for the company to fit all of the necessary components into a dongle, but Curved's concept serves as a good focal point for discussion about directions Apple could take. The dongle is too wide and will block other HDMI ports. Fail. Would actually look more like this, considering power over HDMI hasn't really gotten anywhere. Not everything needs the Air moniker or to be smaller. We need a device that has gaming capabilities, controller support, and fast WIFI AC streaming with more content. If Apple has to double the size, so be it! but does Apple want to "Hide" their device? Normally Apple loves to display their products. So you can no longer connect the aTV dongle to an ethernet cable? Hah! Yeah, no thanks. Hey let's draw pictures of products instead of actually making them! Ok congratulations for being able to use a 3D program. Unfortunately you failed to understand a thing about the product you were modeling. "At CURVED/labs we are one step ahead" : Thanks for highlighting your technical prowess by stating it'd be made out of plastic and have bluetooth "to allow for a Bluetooth wireless connection to control the dongle hidden away behind the television set", but forgetting to add to your pictures how your innovative design would be powered. Maybe there should be a caption "Wireless power solution goes here ->"? Pretty sure that anything Apple release will look 0% like anything you've suggested. But thanks for contributing to the discussion! There's no benefit in miniaturising the ATV to the size of a dongle. Especially when HDMI doesn't provide power. So, why would Apple do it? Surely they want their stuff to be designed, visible and oooodled over. 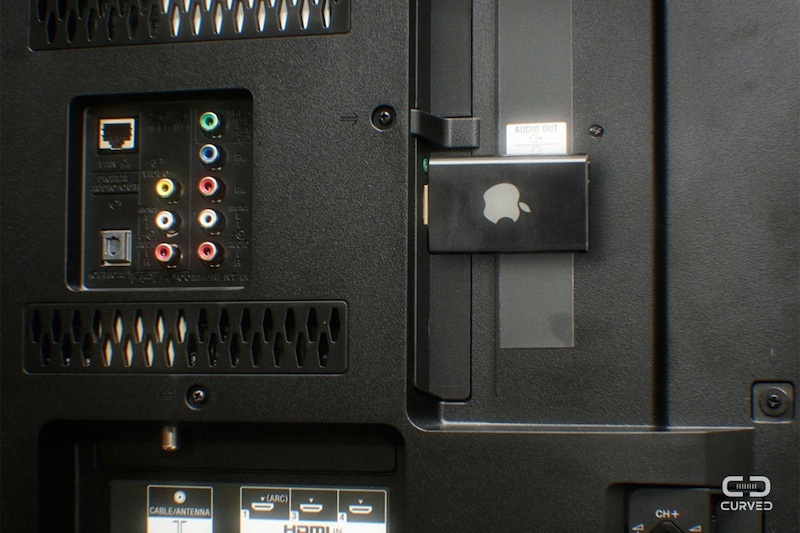 The Apple TV is already too small. Have you tried stack one with an Airport express. They are too light to stop the cables from lifting the units and stopping them from falling around, usually the floor or down the side of my other units. Currently it's a case of style over function. And why do I need an Airport Express they could just add the software to the Apple TV to give it the Airport functionality. Also a few extra Ethernet sockets would be good too.... I wouldn't have to run a mini router then. I personally hate dongle form factors. I have a home theatre set up that is already cramped. I could not fit a stick out the back of my A/V Receiver at this time. I can't understand why people use the speakers from their televisions today. The speakers are so weak compared to what you can get with even a cheap 2.1 set up. Wait, so what problem does this solve again? Are people really annoyed by how much space their Apple TV takes? Or do people constantly move their Apple TV around, and think plugging a cable it is too long? Oh, it actually doesn't even try to solve an actual problem? It just follows market trends for the sake of it, just because the Chromecast and Roku are doing something similar? Then Apple won't do it.